Eight months ago we purchased two acres of land. 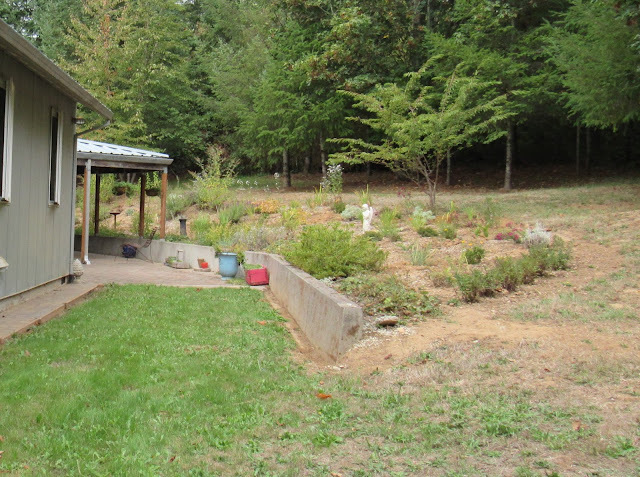 At that time I posed the question: "What would you do with a nearly blank slate to garden on?" I did so knowing there would be as many different answers as there are gardeners in this world. We listened, gathered ideas, dreamed a little, absorbed the message the land was conveying and took action. Everything we have accomplished thus far we are happy with, but there is always room for improvement. We have learned lessons both big and small along the way. We would like to humbly share some of those with you now. By sharing our mistakes we are hoping to spare others frustration. Here is a photo of my blank slate taken some eight months ago with the pink deck and plant prison intact. We learned it's best to try to have plans for construction projects. For example, the only plan David had when building the chicken house was to cut three sheets of plywood in half and go from there. ‎This method demanded a great deal of improvisation and time and going back and forth to the garage for tools and to the hardware store for bits and pieces. Compare this with, say, buying a table at IKEA that comes with all components and tools and instructions to just having an idea to build the same table with a pile of wood. Good luck. While we are pleased with our coop, which we hope to detail here in a future post, it took David too long, he says, and it is by no means square. We like to say parts of the coop are "close" to level but we might be fooling ourselves. At any rate, start with a detailed plan, the correct components and the tools. Tamara's note here: David wanted to build it himself without plans, it was a challenge of sorts for him. In the end it looks just fine and it kept Mr. Retirement out of trouble for a couple of months. Due to the goodly amount of rain in this area, David built the chicken coop high with a sturdy foundation. Can't have the hens gettin' their feets wet! The coop is insulated with R-21 fiberglas and features a double-pane vinyl window for the hens to live in high-style. The hardest part of the whole process was building the main door. Again, no plans. Winging it, so to speak, was fun but not easy. You KNOW Miss Artsy Pants is going to paint some kind of chicken mural on that bad boy to help cover up the green, right? Maybe a clematis or two growing around it would be a nice touch. David has not agreed to any of this. And the hens, which have not yet arrived, will have to vote. Oh, too many conventions on PBS for this blog! Plan ahead for debris removal. When we moved onto the property there existed a large pile of tree limbs in the east half-acre. As wide and as tall as three Chevy Camaros parked side by side. Despite best intentions it remains but now it is encased by a web of blackberries and grasses. We should have taken care of it during the late winter months. Well, we will tackle it soon. Also, and perhaps what we want to say is to plan your debris removal before you start your project. As shown in this post, I trimmed the driveway and swale filbert trees in late winter and instead of hauling off, chipping or burning the resulting limbs immediately we wound up with another multi-Camaro pile. Actually two but the pile on the driveway was more Vega in size. So we had two giant piles and one medium pile. Too big to burn ‎and a lot of hard work ahead. So we tackled it. We rented a wood chipper and enjoyed two wonderful days. That is sarcasm. Ho ho! Now we are down to the one big (original) pile. The lesson here is to address your debris! Don't let it stack up. Take care of it and when done come help us clear our tri-Camaro mountain!! The beginnings of the "Vega pile" in January. Here's the Camaro pile a few months ago. It has grown since then. I'm too embarrassed to show a current photo. You've seen these pictures before, but this was a good lesson to prepare the to-be-chipped limbs for when the rented chipper arrives. They were arranged by size with the cut end all in the same direction. David spent several hours preparing the limbs beforehand and that made the actual chipping a breeze. When we decided some of the lawn needed to go, we used a sod-cutter. This was the most practical tool to use, but we were inexperienced in using it. The result was our first attempt missed several clumps. We had to rent it a second time and go over the whole area again. We also would have left the cut sod in place until ready to till and plant as it was basically a mass of dirt. That made working conditions around the area difficult because if it were dry, there was dust in the air and if we were watering or if it rained, it was a slippery, muddy mess. I also would have tilled a few times to really kill the grass roots underneath instead of just once. Now the weeds are coming back, but they will be tackled, mark my words. Just not the easy way. The lesson is don't be hasty. We were in a hurry to get the rented beast back in time to avoid extra fees. We should have rented it for the whole day. David tackling the first round of sod removal. From the outset, I knew the area I call "the berm" needed help. The soil was pale and rock-hard at the end of last summer. Additionally the retaining wall that holds back the soil also keeps water from draining in the wet months so the bottom of it turns into a sludgy clay mess while the top part, fairly well-drained, is rock-hard. Organic material of any kind seemed to be absent. I would look at in en route to other projects and it kept gnawing at me. I would come dig around in it when I needed to burn off some frustration or had a hard day. It was and still is my "extra" project as it was the only existing garden on site, requiring a redesign to suit the spirit of our new property. I knew the soil needed serious amending with masses of compost and 1/4 - 10 crushed gravel to aid drainage. While the whole berm is now composted, replanted, graveled, and completely redesigned, I would have done a few things differently if I had to do it again. I think it would have been much easier to remove all the plants at once, compost and rototill the whole thing and then arrange the plants and plant them all at once. Of course, this would be a massive week-long project (at least), but the soil throughout would be improved and ready for plants. The way it was actually done was a little at a time, plants moved and moved again and compost and gravel added as I went. In the end, it is really starting to look good but there are still a lot of asters that will be dug and moved to the meadow area which means I will have to go back and amend the soil by hand where they were once planted. In a way, it's probably okay to have done it as I did as it allowed me time to think, plan and move plants as I needed to. Of course knowing me, many plants will be moved around a few times before they find their forever home. The berm area last fall. As it looks in late July. Again, the berm area last fall as seen looking west. Here it is in late July looking towards the west. To put it simply, we should have removed the large dead trees early on. We were preoccupied with other projects and now we'll have to dance around existing plants to make that happen. We have one large Acer macrophyllum or big leaf maple that is completely dead and now we see about three other mature specimens that are also dying of verticilliuim wilt. They all need to go as their decline is certain, and their size is huge. If any of these fell unexpectedly it could spell disaster. We plan to hire David's brother who has some experience with tree-falling to visit and take down the affected maples. We will carefully plan each tree's "down zone" before we start the chainsaws. Here the trunk of the dead big-leaf maple tree can be seen. A little too close to the house for peace of mind. Here it is pictured half-composted. If I had to do it over again I would have removed all the sand from the former "labyrinth" and placed it in a pile for use somewhere else. I would then have had the compost man dump two units right in the center of the circle then borrow our neighbor's roto-tiller. I would take great pleasure in tilling that whole mess up and then have the gravel man deliver about 5 cubic yards of quarter ten crushed gravel and mixed it all in. **sigh** well, live and learn. As it is, I have about that much compost on it already but it's the sand removal that is missing. The sand in there has me worried for the long-term health of my plants. They all look good now, but you never know. This is a big regret. There are a few other thoughts that come to mind when thinking about lessons. First off, we're human and it's okay to make mistakes. At least we're trying. Secondly, it's a long project, the rest of our lives will be spent tending for this beautiful land and we are most happy to live a simple life here doing just that. We don't have to do things quickly, but we get impatient because all around us we see potential and work to be done to reach that potential. There is also the advice that when you are a gardener and you move, that you should wait an entire year before planting anything so you completely understand what your new garden is all about. I did not do that, obviously. I think that's okay, because I'm not the average gardener. I am surrounded by plants every day of my life. I understand many of the plants I grow and love fairly well and know their cultural requirements. I also saw that much of what I was going to claim as new garden area was simply field grass, so no love lost there. In other words, go for it if you have a plan that excites you. Do what you love. But for the big projects, we have learned it is in our own best interest to really slow it down. Okay, try to slow it down. Okay, at least write it down. That, we can do. That wraps it up for this week at Chickadee Gardens. What lessons have you learned in your garden? We'd love to know! I have one word for David: Raccoons. One good thing about plans for chicken coops that you buy online is that they have taken chicken safety into account. I hope David's coop can withstand those prying little hands. They're relentless. Advice taken, thank you Alison! I was thinking the same thing! Raccoons are known for being dexterous and they can and will reach through fencing if their arm will fit, grab a chicken and eat it piece by piece through the wire holes. Chickens are generally not that bright and in a panic will run along the edges where they can get nabbed. I would recommend using 1/2" hardware cloth at least around the bottom 3 feet of the run area and outward at least a foot in an "L" shape to prevent digging under. Can't wait to see what chooks you get! All part of the process of cultivating a new garden. Your fab adventures has just begun! It is a process, indeed. I keep reminding myself of that and having fun along the way! The best lesson in gardening is to learn by trial and error. Well-said, Janneke. Indeed. That's how I learn myself and when customers at the nursery ask for my advice, it's nearly always based on my personal experience. Hi, Alison. This is David. Thanks for the warning about raccoons. We have several of those fat beasts out here on the rim. I believe I have addressed security but will take your comment and further consider what those "prying little hands" may get into. Don't want the girls to be upset. I can empathize with much of what you experienced (except the chicken coop as there's not a chance of having those with coyotes in the neighborhood and no fence at the bottom of the slope). I heard the advice about waiting a year to make big changes but I just wasn't capable of doing that - even though there was no reason to rush, after gardening in a postage stamp sized space for way too long, I couldn't wait to jump in. In retrospect, it might have been cheaper to have employed a professional designer to help me at least create a master plan but that's also water under the bridge now. I knew I wanted pull out grass but I wasn't sure I should pull all of it. Drought and water restrictions belatedly ended that debate but plants I put in the front of beds formerly lined by lawn have had to move - a few times - and some beds could benefit from wholesale redesign now. I comfort myself that learning is part of the process (even if some lessons are expensive). Your garden has already been transformed and I know it's only going to be more beautiful with each year. But you are doing what makes you happy and have a beautiful garden to boot. I think we all move plants (a lot?) as it is part of the wonderful process of creation. Thank you! Our village is very small right now but we hope to increase the chicken population by about 400% very soon. Sorry David, I am a huge fan of all things green but that green? Well it really needs to be tamed by a vine or three. And the chickens will love the extra jungle-like effect. Trust me. Tamara...I am surprised by your use of, and desire to use more of, the roto-tiller. I thought popular sentiment was that by roto-tilling you were destroying the soil structure...to be avoided at all costs! I say this because we did just that, after the sod was removed from our front garden we roto-tilled, and since learning better I thought we committed a major gardening sin? Regarding the roto-tiller. There are indeed two or more schools of thought on this. Preserving soil structure is by far the best method. I did that with the sheet-mulching and it worked fairly well for my first attempt. This was too large of an area to reasonably do that right now, plus the tilling method is often used in meadow-making which is essentially what a lot of this "blank" area will become. The soil is disturbed, yes, but the idea is that the seeds or plants of what I want will have a fighting chance against the grass roots and eventually be able to take over. It's the grass that is the issue here. That's the short of it, there is a longer more boring explanation I'll save for the next time I see you if you are interested. No sin committed by you, just another way of accomplishing the same goal. The soil will heal if it's taken care of like you will and have certainly done. Oh, Danger - David has thick skin, no worries! You're certainly not the first to say that, either. it's always amazing to see what HUGE accomplishments you guys have made so far. And yes, i don't think you would need a year to figure out what the existing landscape was telling you because you're a professional! I have a question about the sand in the former labyrinth area...how might that hurt the plants? should be optimal for plant root health. So it's easyto see how the practice of adding sand to clay soils has evolved. plant failure and perhaps will be addressed in a separate column.)" Oooh, thanks, T! That makes a lot of sense, actually! Not mistakes--learning experiments! You've made impressive progress. Looking forward to seeing what happens next. Indeed! Experiments is the key word. Thanks for the encouragement...more changes to come! Good lessons, all. My nibbling approach saves me from big mistakes but also denies me big results. The thing I can not seem to avoid is planting things way too close together. After several years, that tendency is starting to catch up to me. That is the most magical phrase, "purchased 2 acres of land"! I know the big refuse piles would drive me crazy too, and dead trees, but nothing sounds irreversible, and I'd be just as itchy to get going. I think this is the way to go, rather than hanging back and possibly lose momentum, because that's a lot of land! Oh, isn't it? And I agree, Denise, that just keeping momentum up is key when you have this much to deal with. Just keep moving and collapse when I'm 87. Despite the lessons learned, I am in awe of the work that has been done. The berm is especially impressive in person. A beautiful work in progress. Thanks, Jennifer! I hope you can come back and hang out with me in Saint Helens again soon - summer here is, as you know, lovely.